November 21, 2013, Oakland, Calif.: California’s social and economic well-being is directly tied to financing for reliable, sustainable water. A new study from the Pacific Institute explores stable and sustainable sources of funding for water projects as a key to long-term solutions, and finds California’s increased dependence on general obligation (GO) bonds in funding water systems is unreliable and costly to both the state and taxpayers. There is a growing urgency to find mechanisms to reinvest in water and wastewater management systems in order to continue to provide reliable, high-quality water services as California deals with the direct and indirect impacts of climate change and extreme weather patterns, decaying water and wastewater systems, ecosystem challenges, emerging contaminants and stricter water quality requirements, and population and economic growth. The report, Beyond Water Pricing: An Overview of Water Financing Options in California, reviews the some of the major local, regional, and statewide water financing options in California, variations of which many water utilities are already employing, including municipal bonds, state revolving funds, public-private partnerships, and public benefit funds. 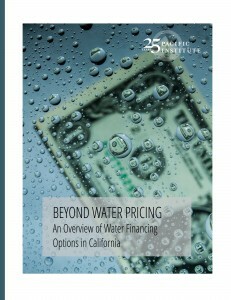 The report Beyond Water Pricing: An Overview of Water Financing Options in California can be downloaded free of charge from the Pacific Institute website at www.pacinst.org/beyond-water-pricing/.